We'll have deployed over 19,000 blocks by my next report..
What a see-saw.. One day we catch flounder pretty as you want (for this year!) ..then I go to similar bottom the next day and catch sea bass. Even when I'm confident we'll catch one and not the other.. Nope. The only thing predictable about this fishing is that my crew & I will give 100% to putting something tasty in your frypan..
Been that sort of year. Staying late a lot of days. Had a screaming current a few days ago. Not much biting. Current backed off, fish bit. Young fellow aboard & badly seasick was not at all happy with me staying late. I had to explain (ahhh..) how the eclipse had thrown my clocks out.. 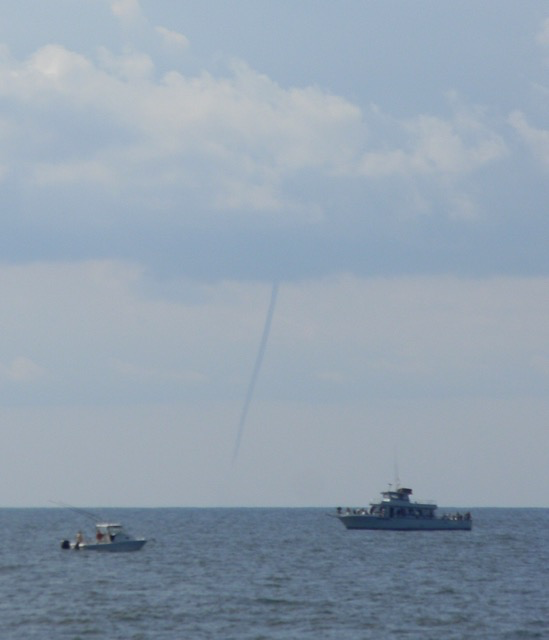 Some days there's just no fixing it; but mostly we're sending everyone home with dinner - a good fishfry w/neighbors or family..
Had a waterspout 8/26/17 about 12 miles SE my position. I've seen waterspouts. But NEVER on a pleasant day. Calm, Fish Biting OK, Not Much Swell, No Rain -- WATERSPOUT! The Memorial Day Storm of 1987 created lots of 'em. Some boats didn't make it home. With near hurricane force NW winds for about 3 hours; it was the only time I ever had a mate, Tucker, bring a lifejacket to the wheelhouse. Many small boats were saved in DE Bay by freighters turning side-to the wind; creating a lee to hide behind. Seven people died.. So here's this waterspout thirty years later.. I have it on radar - can paint the ruckus it's kicking up on the surface anyway. A bit of rain offshore in tiny patches. 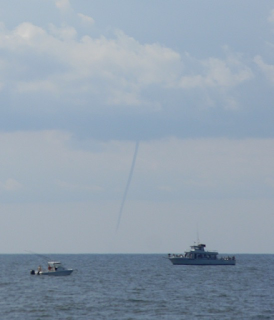 Other funnel clouds start to make up but never make it to water. I have it moving, slowly, in the perfect direction -- away. A large freighter seems to hold course right for it. Wish I'd watched. Funnel Gone. As I recall, there's a section in Bowditch's American Practical Navigator on sailing directly into a waterspout. Have to look that up. Dern sure won't see the Morning Star doing such. Not if I can see it coming. Summer about over. Lots of days this year, pretty days, we'd get underway and leave a marina full of moored boats - empty parking lot. Yes, there were busy days too -- boats fishing in tournaments..
Really makes me wonder about MRIP's thinking. Man with serious juice at MRIP told me, "Of COURSE THEY CATCH MORE FISH!! There are lots more private boats than For-Hire!" We'll look at that below -- the MRIP estimates. What I see is guys who have a modest boat are a LOT like anyone else -- just that they like fishing, or sailing; just being on the water. They're not super rich and can afford to fish every possible day. Aside from a few truly accomplished anglers, they're no danger to US fish stocks either. Mostly I see private boats that fish very few days a year. MRIP sees Private Boats capable of outfishing ALL Trawl, Trap, Party, & Charter -- ALL OF 'EM. 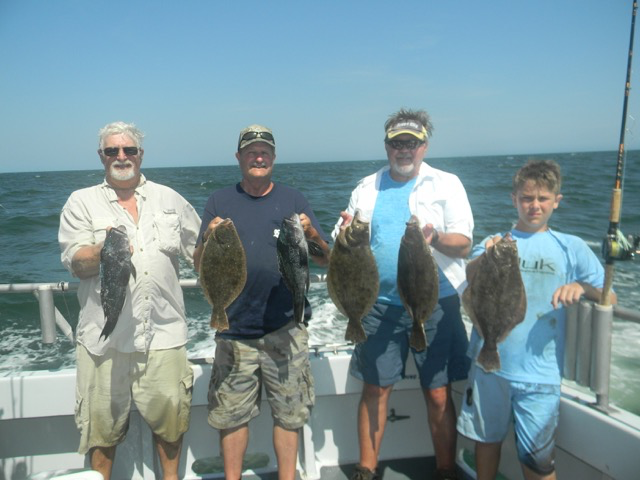 Often times a single Mid-Atlantic state's Private Boats will be shown to have outfished all professional effort, both Commercial & For-Hire, from Cape Hatteras to Maine. It took a long, long time, but I believe the majority of managers have now begun to seriously question MRIP's assertions. Below I intend to aid that newish thinking with some comparisons..
You see, even though my mates Dan & Wes have only been with me a few years, they'll often know a large portion of a day's anglers. Sometimes all of them. In the marina there's some turnover, but more often the same folks are enjoying summer every chance they get. Having gone 'to the boat' does not equate with having gone fishing. The slip holder's summer is about leisure. Yes, some fellows fish much more aggressively -- and target a wide array of species -- but they get good by going a LOT. And that's my point -- the participants are a fairly consistent set of anglers. Whether in the For-Hire trade or in the Private Boat fishery; people get to know each other. Newbies? Sure. They'll need a LOT of practice though to become what better anglers would recognize as "skilled." What I'm getting at is my "percentage of the fishery" theory for checking recreational catch estimates. The very first MRIP catch estimate I looked at had NJ's Shore Anglers catching MORE tautog in March/April (before they've even begun biting) than ALL United States Commercial & For-Hire--BY FAR--in the same period. The "new & improved" MRIP recreational catch estimates had added 100,000 tautog to what had been the dumbest MRFSS estimate ever.. I knew we were in trouble deep --- and are. When newspapers somberly report 'recreational overfishing' or managers shake their head in disbelief because NO AMOUNT OF REGULATION can stem our unstoppable harvest -- It's This MRIP Data They're Using! For 2010 MRIP has those NJ Shore Anglers catching 469,367 lbs of tog in Mar/Apr -- & all states' Shore anglers from NC to Maine catching 653,418 lbs. Compare to all US Trawl, Trap, & Party/Charter -- all professional effort, all year, landed less at 649,665 pounds. I just re-researched it. It's still in the system. NO ONE IN MANAGEMENT BELIEVES NJ SHORE ANGLERS CAUGHT LIKE THAT. ..and there's lots and lots more data just like it all throughout the MRIP estimates. MRIP stinks worse than a week-old forgotten cooler of August fish guts. Yet MRIP's data is being used to POUND the recreational fisheries with ever & always tighter regulation. Because we're always 'overfishing,' regulators always need to tighten the season, decrease bag limits & increase size limits. I've written about it since 1998. I am confident -- positive -- that by using data we For-Hire fishers surrender on a trip-by-trip basis, MRIP can be tested for veracity prior to its use in regulation. We can truth recreational catch data if we know a 'percentage of the fishery' where For-Hire & Private Boats are concerned. Because MRIP has continued to escalate the ever-increasing catch of Private Boats begun by MRFSS in 2003, and that's POSITIVELY why we lobbied so hard for a recreational catch data's repair: arresting simply the Private Boat overestimates would stabilize recreational regulation in short order. MD has it's fair share of over-estimates. They're not usually on the order of larger states, but because we've only a single port w/ocean access, the stupidity of bad estimates is sometimes easier to spot. 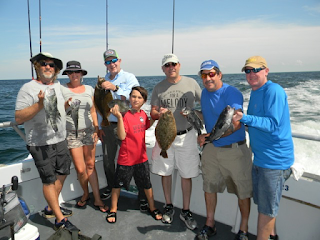 When I told a young mother about a MD Private Boat estimate asserting 19,000 tautog caught in March/April, someone with no Fisheries experience--neither in data or science: she replied, "There's not even 19 (expletive) boats in the water then, and they sure didn't catch 1,000 tog apiece. That's just stupid." And it's DESTROYING our fisheries through overregulation. 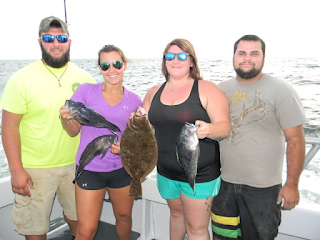 From long voiced troubles on red snapper, and now triggerfish -- the groupers; king mackerel, cobia, tautog, sea bass, summer flounder, cod, haddock, wolfish/ocean pout, tilefish, tunas -- on and on and on it goes. Saddest part is, managers are so focused on recreational catch at each and every whisper from MRIP's estimates: Real science, the biological & ecological sciences we need showing historical habitat abundance & need of repair, spawning productivity, and science able to create a vital understanding of habitat fidelity's role in quota management -- none of this science is even a thought. MRIP estimates take all available man-hours to sort out. They CAN"T make sense, and are therefore far harder to deal with. No longer is overfishing from GIANT overseas factory trawlers a concern, nor US Trawl, nor foreign Longliners & then US; nor US Trap fishers & Party/Charter. Today's managers are being SHOWN PROOF that little plastic boats, and sometimes even anglers from shore, are decimating stocks so swiftly that their carefully crafted 'restoration plans' cannot keep up. Fishery management would all be so peachy if they could, at long last, arrest overfishing by the guys who take their wife & kids a couple times a year. This MRIP business has grown way out of hand. Last year's flounder/fluke debacle, the ongoing sea bass disaster--now a volcano of bad data building again, cobia closed in federal waters -- cod closed in all the Gulf of Maine because small plastic boats from Massachusetts took more cod in March/April than all US Trawl.. But people who were there for any of these say that's ludicrous beyond belief -- in Massachusetts even to say those small boats caught 10% of Party/Charter's landings in that late winter chill would be unsubstantiable -- let alone far more cod than All US Trawl, in March..
No Matter Absence Of Truth -- Closed. No matter the absence of any real & true science -- Feed More Bad Data In & Create More Bad Regulation. Personally, I believe Private Boat sea bass, in the heaviest pressured areas and heaviest pressured times of year, catch about the same as Party/Charter. Who, after all, do all the anglers fish with who do not have a boat suited to a particular fishery? As MRIP sees it, Americans who love to really KILL fish have been so successful in business that far more private fishers own a large ocean-going outboard; these fabulously successful/wealthy anglers VASTLY outnumber those who must instead suffer a day with professional Party/Charter crews.. But no matter my personal thoughts, to cut a cross-section of each region's best anglers in conjunction with VTR data would create a fairly solid "percentage of the catch" test for MRIP data. Sit Down And Figure It Out. Yes, it's different for different species. Yes, it's different for different places & especially times of year. But it's completely doable. A test for MRIP data can be fashioned. Right now MRIP can be made to suffer NO TEST, save statisticians saying how much they like it. Below are a few tables of uncorrected MRIP data; exactly the data used by management to determine our level of overfishing. It's absolutely pathetic. Sea bass, it's plain to see, are headed for BIG TROUBLE. If instead of MRIP's wild guesses alone, were we to use Vessel Trip Report data (VTR) surrendered daily by For-Hire fishers as foundational in creating what are called Bayesian Stops in these statistics, accuracy would improve immeasurably. If we had a place, a level of catch, where Private Boat & For-Hire catch COULD NOT EXCEED, we'd be far better off than today. When these statistics insist Private Boats from a single state, in a single two-month period, have outfished all US professional fishermen, both Commercial and recreational For-Hire; when you could walk to the moon on Private Boat catch---and managers act on that information as if handed them by the president of the bank: both fish & fisher lose ..and, in not even looking for truth, cause is completely missed: our nation's fisheries restorations haven't a prayer. Here in this first table, for instance & even w/o VTR data, If we believe Private Boats generally catch about half again as many sea bass as Party/Charter - that is, 1.5 X the For-Hire catch - then the recent MRIP assertion of Private Boats catching 40.6X more sea bass than all Party/Charter would cause flares to be shot -- flags to be raised. It's WRONG. Private Boats DID NOT have some magical catch this spring that shot them far out of proportion to the For-Hire catch. But there are no flares, no red flags, save from a couple of us on the internet. Summer Flounder (Fluke) NC above Cape Hatteras to Maine..